With over 300 million users, you can’t go far these days without seeing someone staring down at their screen, scrolling through Instagram. It makes sense, as Instagram is the fastest growing social media platform out there. It has become THE social network over the past few years, and as it turns out it’s actually a great platform for marketers too. Many brands, both B2B and B2C, have hopped on the Instagram train to find a surprising level of success. But how can you get followers engaging on Instagram and creating user-generated content? An Instagram hashtag contest is the perfect solution to incentivize engagement with your brand, get user-generated content. and ensure your brand is seen by your entrant’s network. Let’s find out how you can effectively create and run your own! An Instagram Hashtag Contest is one of the simplest ways to get fans interacting with your brand. It involves an individual posting their own picture on Instagram, then tagging it with a specific hashtag that your business has chosen. All pictures uploaded with that hashtag are then displayed in a gallery page on your website or Facebook Page as well as being shown in one single stream on Instagram. This type of contest allows you to deepen the emotional connection you have with followers. You get them communicating about your business to their own networks while also capturing user-generated content which you can then use for future marketing efforts. What’s better than having fans as brand advocates? Not much at all. Once in the gallery, all photos with the hashtag can then be voted on, shared or liked. This increases the reach of your contest and your business massively, allowing other users to discover you on the platform. You can then choose if you want to display submissions in the gallery based on most votes, most recent submission, or randomly. As a contest provider for the past few years, we at Wishpond know exactly what types of contests work in engaging followers and increasing your fanbase. And Instagram Hashtag Contests is our fastest growing contest segment. So why all the fuss? 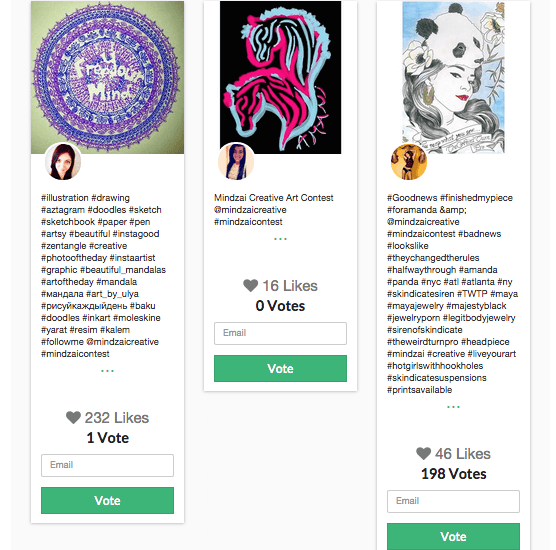 What makes an Instagram Hashtag Contest so effective? With the Wishpond Instagram Hashtag app you can require contest participants to follow your business’ account and/or @mention your name in their photo. As nice as it would be for me to describe in great detail each and every element of a good Instagram hashtag contest, looking at examples is probably a better way for you to gain some inspiration. 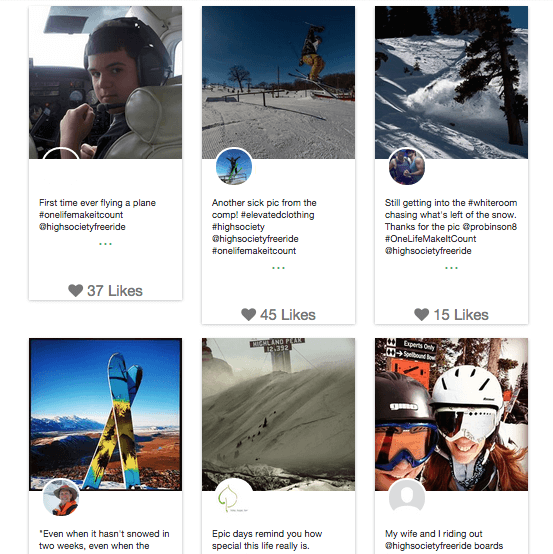 This contest, run by outdoor and sporting goods store High Society Freeride, got users engaging with the business by showing things they love to do in the great outdoors. 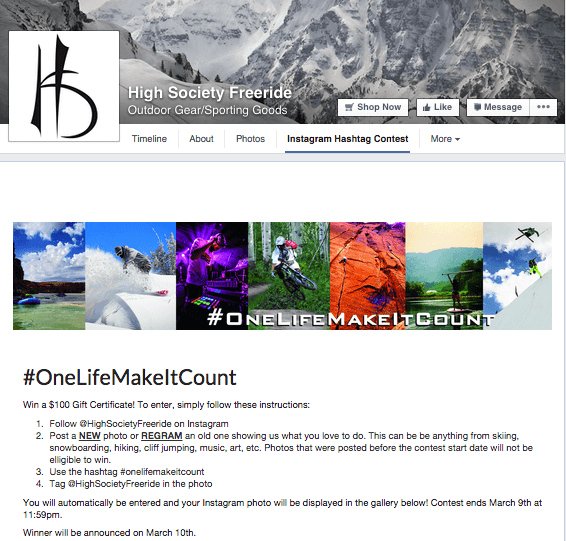 The hashtag #onelifemakeitcount really appeals to High Society’s target market (young people). The hashtag got users to share content that they would actually want to post as it revolves around photos of things they’re passionate about. It’s also likely that their target market has a bunch of relevant photos within their Instagram account anyway. The prize of a $100 gift certificate is relevant and valuable to Instagram users (more valuable, even, than a specific product worth $100). It is also proportionate to the level of effort required for users to participate. They have asked users to tag their business in the photo, allowing all uploaded images to also be shown on their account in their tagged photo section. 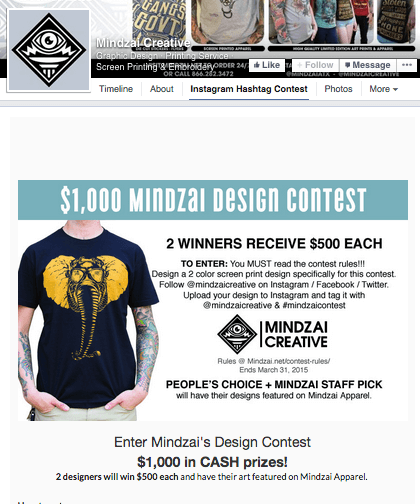 Mindzai Creative chose to use an Instagram Hashtag Contest to find their next print design. It makes it very easy for participants to submit their drawing with the simple upload of a photo. They chose to select 2 winners, incentivizing participants to enter as they have a greater shot at winning. I also like how they are choosing the winners differently, one by popular vote (which also increases the user’s feeling of being directly involved and cared about by the brand) and the other by the Mindzai staff. 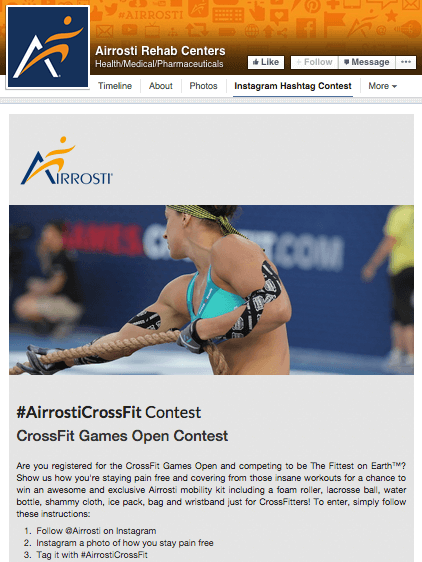 Airrosti is a healthcare group that delivers musculoskeletal care and does a lot of work with Crossfit clients. They’ve required entrants to follow them, growing their Instagram fanbase and increasing awareness of their brand online. They’ve chosen a contest theme that is very relevant to prospective followers, allowing them to showcase their individual fitness training for the Crossfit Open, while still tying in their brand. The prize package is very specifically relevant to their target audience. Offering very active people these types of products that are valuable to their needs and interests is perfect. They know what crossfitters would want to win and have chosen their prize accordingly. Coming up with a hashtag that works for your business doesn’t need to be too complicated. Think of your business’ name and the goal you’re looking to accomplish with your campaign. For example the High Society hashtag #onelifemakeitcount is a fairly broad hashtag open to partcipants’ interpretation while Mindzai’s campaign has specific guidelines and uses the simple hashtag #mindzaicontest. Make sure your hashtag is something that is easy to remember and grabs the attention of users. That way if they see their friend’s photo with your hashtag they will keep it in mind and possibly enter themselves. You also want to aim to keep it as short as possible while still maintaining meaning. Users are much more likely to use a 6 character hashtag than a 20 character one. A holiday theme is also a great idea for a hashtag contest as users post more pictures around the holidays and are more interested in winning themed gifts or prizes. For a holiday contest check out my colleague Samantha Mykyte’s article “ How to Run a Holiday Hashtag Contest on Instagram” here. As long as it is unique and specific to your brand and interesting to your users, any hashtag can work. The more creative and fun though, the more success I’d bet on. Instagram hashtag contests are one of the best ways to engage your audience on social and get them interacting with your brand. Post your own photos on your account to promote the contest and ensure all of your Facebook and Twitter followers are aware of the contest to maximize participation. 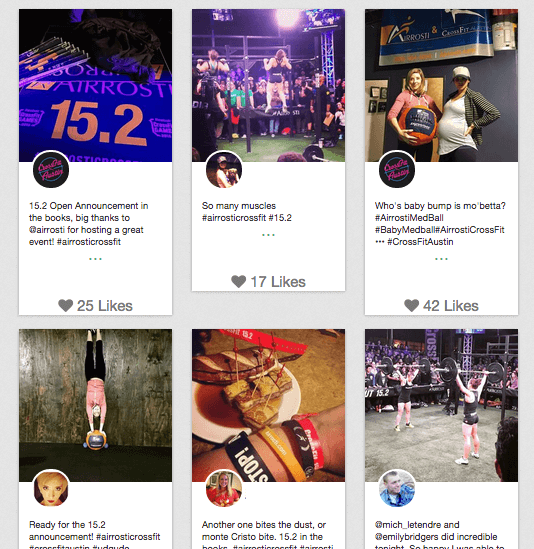 Have you ever run an Instagram Hashtag Contest? I would love to hear your experience in the comments below!